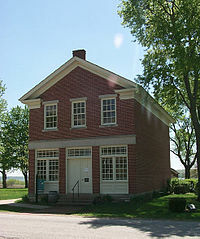 The Red Brick Store in Nauvoo, Illinois, was a building that was constructed and owned by Joseph Smith, the founder of the Latter Day Saint movement. Smith constructed the Red Brick Store in 1841. The building became a center of economic, political, religious, and social activity among the Latter Day Saints. In addition to being a mercantile store, the second floor of the building also served as the headquarters of the Church of Jesus Christ of Latter Day Saints for a period of time. Members would visit the store to pay their tithing and other offerings to the church. the first performance of the Nauvoo Endowment ordinance, on May 4, 1842. After Joseph Smith was killed and the majority of Latter Day Saints left Nauvoo, the Red Brick Store fell into disrepair. Eventually, it was torn down and the bricks were used to construct new buildings in Nauvoo. In 1980, the Reorganized Church of Jesus Christ of Latter Day Saints rebuilt the Red Brick Store on the original foundation as part of its 1980 sesquicentennial celebrations. Today, the Red Brick Store is owned and operated as a tourist attraction by the Community of Christ. The Store sells goods that are similar to the kind that were sold in the Store in the 1840s. In Manti, Utah, the headquarters of the True and Living Church of Jesus Christ of Saints of the Last Days (TLC Church) is located in a building named the Red Brick Store in honor of Smith's original structure in Nauvoo. Wikimedia Commons has media related to Red Brick Store.